Montreal isn't exactly known for its beaches—swim-friendly waterfronts are not as common as public swimming pools—but there's still a quartet of sandy spots to visit. The best part? Most of them are located within city limits and three of which are accessible with public transit, so it's an easy afternoon trip to the waterfront on a sunny day. Located on Île Notre-Dame, Plage Doré du Parc Jean-Drapeau is one of two man-made islands that make up Parc Jean-Drapeau. This golden-sand strip really does the trick on a hot and humid day. It's also one of the easiest beaches to get to in Montreal, being only five minutes from downtown via car, subway, or bike. Most locals go here after an active summer day of walking, picnicking, dancing, rollercoastering, gambling, and sight-seeing around the multi-purpose park. The 15,000-square-meter swimming area also features plenty of waterfront activities like beach volleyball, inflatable slides, kayak rentals, and stand-up paddleboards. Montreal Clock Tower Beach is the latest addition to Montreal's handful of beaches. 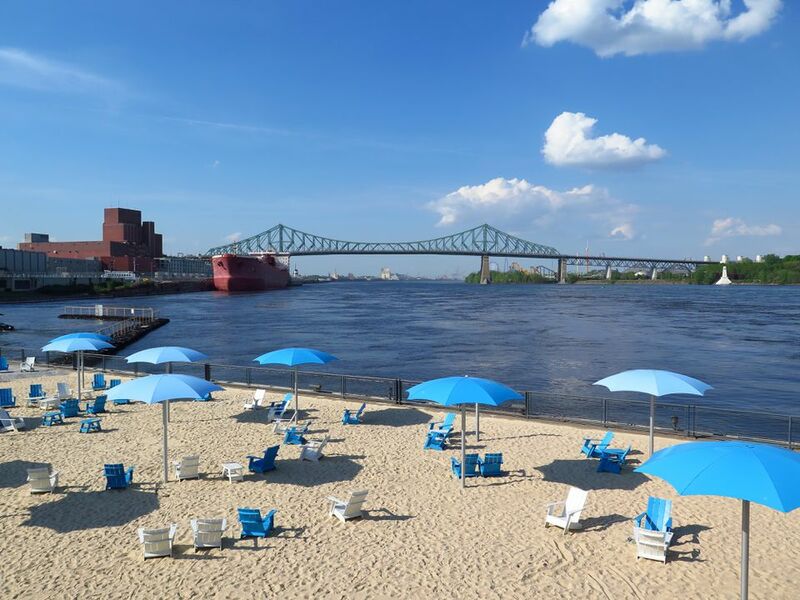 With 1.3 hectares (3.2 acres) of urban getaway in Old Montreal's Old Port, it's a place where locals and visitors can cool themselves off by the misting stations and then lounge in the sun or under a parasol in the comfort of a long chair. The skyline view is choice in that area too. Note: it's more a place for tanning than swimming. During the summer season, it costs $2 to enjoy the beach or $15 for a season pass. On evenings when Montreal's Old Port has firework displays, it costs $5 to enter (starting at 7 p.m.). Perhaps best known as the other Montreal beach, Cap St. Jacques is Montreal's largest park, a whopping 288 hectares (712 acres) of silver birch and maple woods, fields, and farmland with a sliver of beachfront. As far as city beaches go, Cap St. Jacques doesn't feel remotely urban, a suitable antidote for weary car-less city-dwellers in dire need of refuge. Just be ready to sacrifice anywhere from 45 minutes to one-and-a-half hours of subway and bus travel plus about 20 minutes of dirt road walking to get there. And try to make it on a weekday to beat the crowds because people tend to pile up on that patch of sand. Bois-de-l'Île-Bizard is a haven, and a local favorite place to be in all of Montreal. But it's a trek and then some to get there without a car. Factor in two hours of public transit followed by a 40-minute hike—or consider cycling—to get to the park. But once you're on the boardwalk, taking in the cattails and marshland, you tend to forget the trouble you went through to make it to the small island sandwiched between Montreal and its northern metropolitan cousin, Laval. The beach itself is a natural sight for sore, urban-weary eyes, making it the ideal staycation destination.